New Zealand Cricket has gone back to its roots with the reintroduction of the Plunket Shield as the trophy for the men's first-class competition this summer. The shield was first introduced in 1906 and was replaced from 1974-75 by the Shell Trophy, which was itself succeeded by the State Championship in 2001-02. But the loss of State Insurance as sponsors for 2009-10 has prompted a return to the Plunket Shield, which has been on display at the New Zealand Cricket Museum in Wellington. The NZC chief executive Justin Vaughan said he was excited at the prospect of dusting off the trophy. 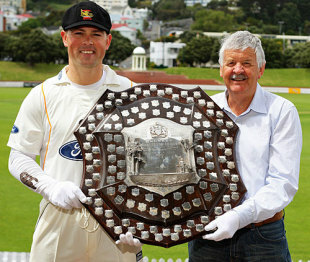 "The Plunket Shield has a strong place in our cricket history," Vaughan said. "The reintroduction of the Plunket Shield allows us to acknowledge the traditions of the game and at the same time appropriately celebrate and promote our four-day first-class competition. For the first time in a decade we find ourselves in a different sponsorship environment - and this gives us the opportunity to restore real history and heritage back into our first-class competition through the Plunket Shield. "The Plunket Shield has been the historical foundation of domestic cricket in New Zealand for over a century - and New Zealand Cricket is committed to retain the Plunket Shield for our four-day first-class competition into the future. The naming rights for this competition are not for sale. We look forward to some great performances in the four-day competition and we hope cricket enthusiasts will get out and strongly support the reintroduction of the Plunket Shield." The shield was last won in 1974-75 by an Otago side captained by Glenn Turner. He said it was pleasing to see the prize back up for grabs 35 years later. "The Plunket Shield was our only first-class competition at that time," Turner said. "There was no one-day game, and just five rounds of three-day matches, so the competition was intense. The Shield was a real symbol of inter-provincial rivalry. The four-day game remains the pinnacle of our domestic cricket, so it will be great to see it back as the focus of the competition." The season kicks off next week with the first round of four-day games. The six teams play five rounds before Christmas and a further five rounds in February-March.